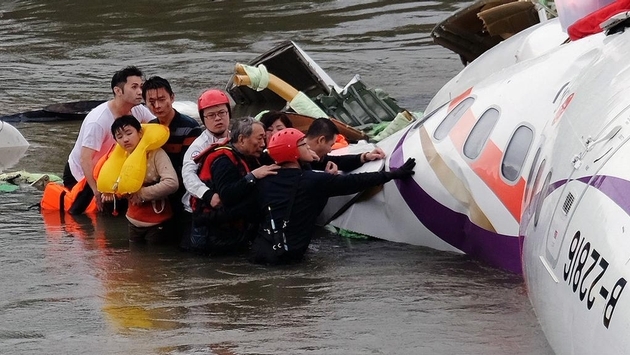 Rescue teams continued the search today for 12 people still missing from the crash of the TransAsia Airways turboprop plane that went down in the Keelung River in Taipei on Wednesday. Those still missing include the two pilots. Some 58 passengers were aboard the flight and at least 31 people were killed when the aircraft flew over a bridge, clipped a taxi, clipped the overpass, and crashed into the river. The river was shallow enough that at least one survivor actually walked to the riverbank and was found in a nearby park. According to the Wall Street Journal, the design features on the ATR-72 Turboprop might have helped save lives. The plane, designed to fly at slower speeds than a conventional jet engine, was also designed to float for a sea landing and built to equally distribute shock, the paper noted. If you look closely at the dramatic still photos or dashboard camera video, you will see that the fuselage is slightly wider than you might normally see.